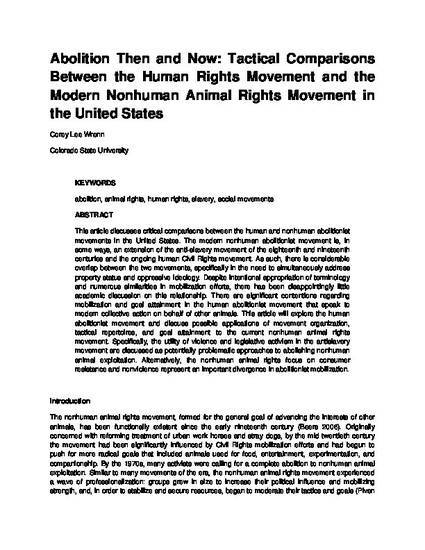 This article discusses critical comparisons between the human and nonhuman abolitionist movements in the United States. The modern nonhuman abolitionist movement is, in some ways, an extension of the anti-slavery movement of the eighteenth and nineteenth centuries and the ongoing human Civil Rights movement. As such, there is considerable overlap between the two movements, specifically in the need to simultaneously address property status and oppressive ideology. Despite intentional appropriation of terminology and numerous similarities in mobilization efforts, there has been disappointingly little academic discussion on this relationship. There are significant contentions regarding mobilization and goal attainment in the human abolitionist movement that speak to modern collective action on behalf of other animals. This article will explore the human abolitionist movement and discuss possible applications of movement organization, tactical repertoires, and goal attainment to the current nonhuman animal rights movement. Specifically, the utility of violence and legislative activism in the antislavery movement are discussed as potentially problematic approaches to abolishing nonhuman animal exploitation. Alternatively, the nonhuman animal rights focus on consumer resistance and nonviolence represent an important divergence in abolitionist mobilization. Wrenn, C. L. (2014). Abolition then and now: Tactical comparisons between the human rights movement and the modern nonhuman animal rights movement in the united states. Journal of agricultural and environmental ethics, 27(2), 177-200.